A&E executives think Hoarders deserves an Emmy for exploiting people with increasingly troubling mental health issues and sending the average viewer into a cleaning frenzy every week. 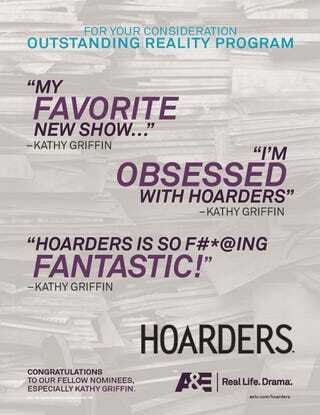 In a new ad campaign, the network uses fellow Emmy nominee Kathy Griffin's words against her, quoting her declaration that "HOARDERS IS SO F#*@ing FANTASTIC!" Of course, Kathy couldn't let the comedic opportunity pass, so she responded with her own A&E-style ad. The cat's paw is a nice touch, and a great reminder of why I bailed on that show along time ago.